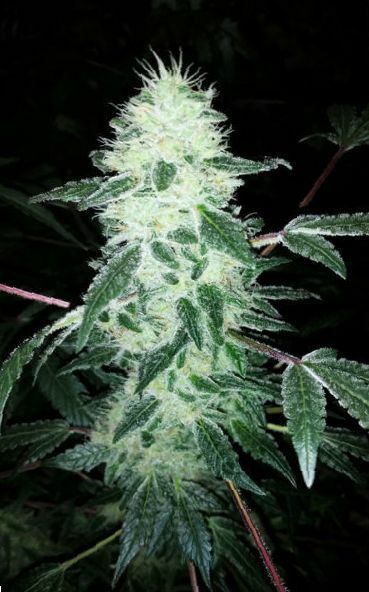 Elev8 Seeds is the creator of Gorilla Cookies, mixing the thick terpene count of Thin Mint Girl Scout Cookies with the high trichome and resin production of Gorilla Glue # 4 to produce a delicious and powerful weed. 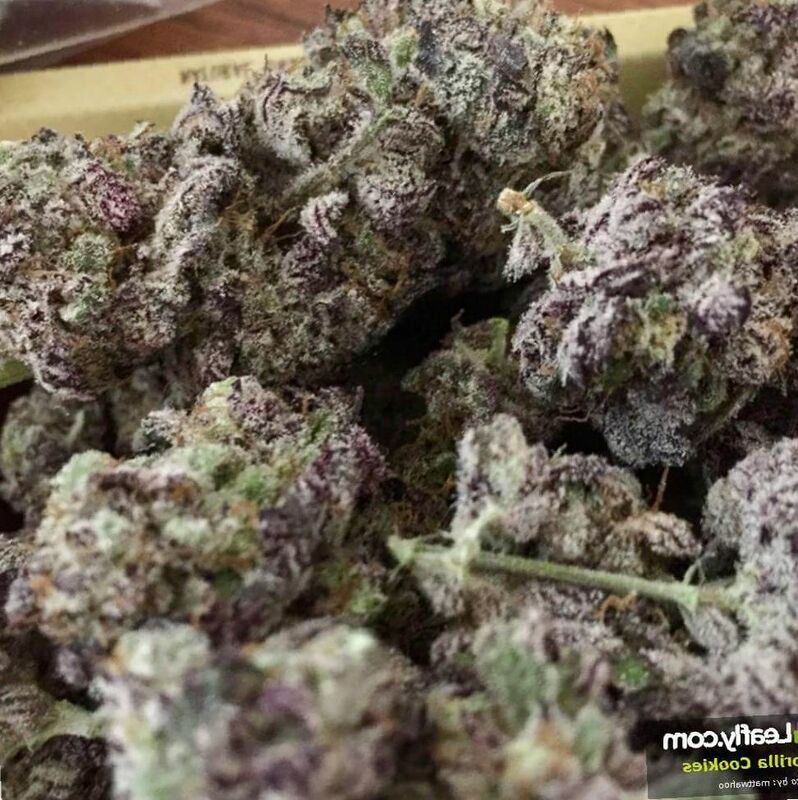 Gorilla Cookies Strain medicinal cannabis is relaxing and has high THC levels. It can help with pain, mood disorders, insomnia, and everyday stress. Indoor/Outdoor Yield Gorilla Cookies will yield about 500 grams per square meter. Flowering time Gorilla Cookies Strain buds will flower in about 65 days. Harvest Gorilla Cookies Strain weed plants will be ready for harvesting outside in the of the month October in the United States. Disease resistance Gorilla Cookies has high resistance to disease, temperature, and chemical damage. Plant Height Gorilla Cookies Strain cannabis plants will grow to a tall height, about 6 foot. 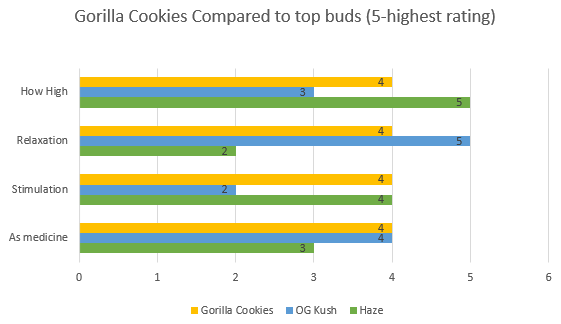 Adverse effects Gorilla Cookies can cause a bit of dryness in the eyes and in the mouth. In overdose it can cause a bit of panic, or conversely drowsiness and sleep. Overdose can cause disturbances in perception and movement. Growing difficulty Gorilla Cookies marijuana will need a bit of care and attention. 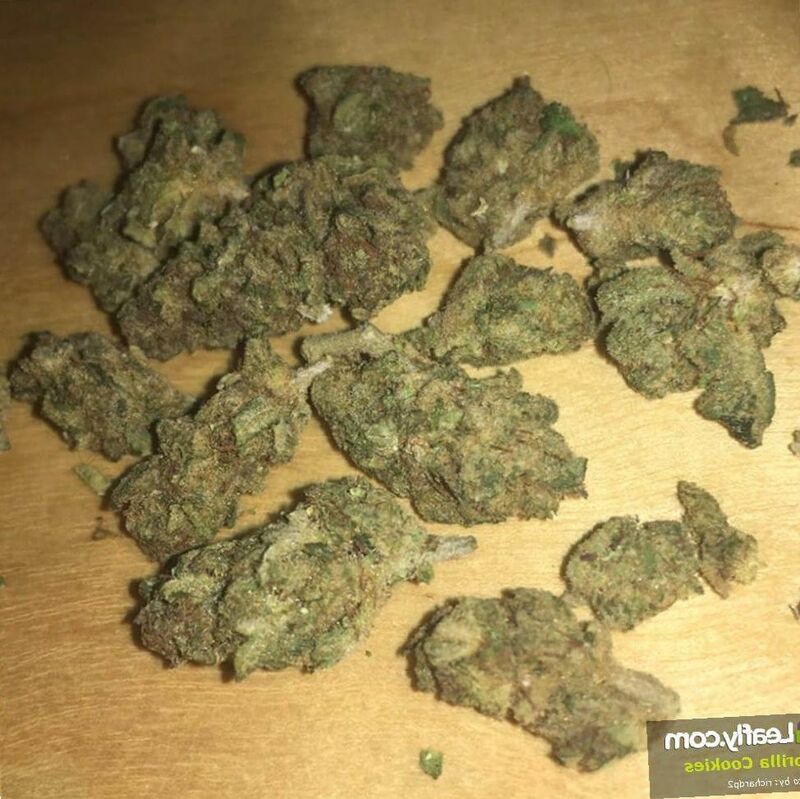 As you can see from the picture above, a group of nuggets of this Indica looks like a bowl of frosted Fruity Loops cereal. Why? Well, the absolute onslaught of THC packed trichomes is the major reason. Also, the buds have a Sativa structure, which produce these big dried nuggets. The buds are tinged in purple by a few nights of overnight lows, bringing out the healthy anthocyanins, same thing that makes wine red and dilates blood vessels. The fragrance of Gorilla Cookies is bequeathed mostly by the Thin Mint Cookies parent. 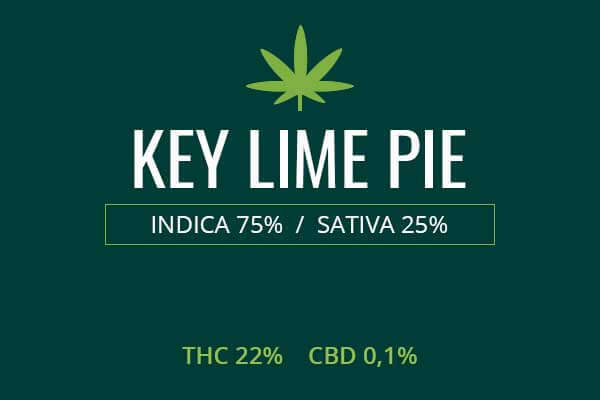 This gives it a wide variety of terpenes which provide both scent and flavor; limonene for lemon favor, myrcene for mango flavor. 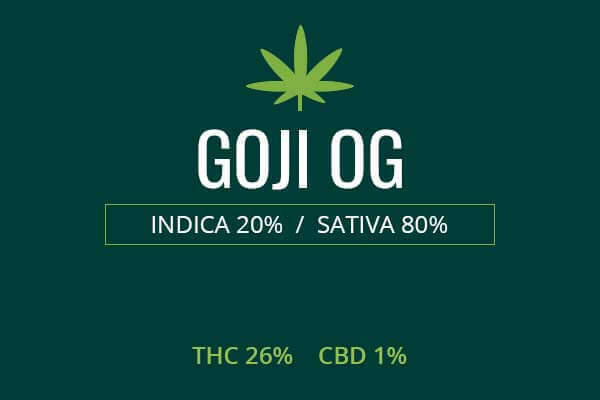 These also have psychological effects by changing the effects that THC and other cannabinoids will have on the user. Growing weed from Gorilla Cookies Strain cannabis seeds or cuttings requires a high growing ability. 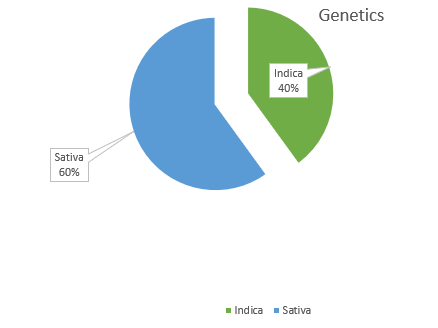 The plant is feminized and produces feminized seeds. Obtaining seeds appears to be very easy but be sure it is legal in your jurisdiction. This plant can be grown outside, inside, or in a greenhouse. Let’s look at growing weed in a greenhouse. The reason to even consider doing so is because this gives you the best aspects of growing outside and of growing indoors. You can control the environment just like if growing indoors or in a tent. But you can also use natural sunlight, the real ground, outside air, and plentiful room like growing outdoors. You get the benefits of both, avoid some of the drawbacks, but of course there will be a few disadvantages as well. It can also produce the warmth of being close to the equator in areas where you are far from the equator. Weed pretty much grow naturally in areas closer to the equator. Green house growing can also produce a more potent weed. To those who usually grow outdoors, using a greenhouse can reduce damage from pests and extreme weather changes. Growing weed in a green house, you can either plant right in the ground, or you can use flower pots. Be as discreet as possible, as the smell can draw attention. You can buy automatic systems to do much of the care for your plants if you have limited time, but you can do all the work yourself if you enjoy being in your weed garden. If you grow indoors, you can use a tent set up. Place reflective lining around the tent to keep the light intense. Use high discharge lamps, placed strategically around your plants. You can use 5 gallon flower pots and fill it with your organic Flower Power soil and nutrients. Put your seeds or cuttings in, you’re ready to roll. Make sure you’ve got overflow holes in your pots to avoid over watering. To keep the air dry and clean, use a fan and exhaust system. An air filter can help reduce the chances that mold and mildew will infect your plants. After about 65 days, you’re ready to induce flowering with 12 hours of light, and 12 hours of darkness. You can get a yield of 500 grams per square meter. Outside choose an environment that is Mediterranean or like the OG environment in California. That’s the ‘ocean grown’, not literally the ocean, but sunny with crisp air. Use organic soil. Plant away from access by pests and anyone who might be suspicious even if legal. This plant is strong and resilient and will thrive outdoors. You will get a great yield for each plant. You can store your weed after you dry and trim them from your bundles with a system like a Cannador with CVaults. You can also use regular old darkened mason jars. Just make sure there’s not too much space for air in there, and it’s cool and dry. Among the things which medical marijuana can help, one of the top conditions which is an indication for medical marijuana treatment is spinal cord disease. Spinal cord disease is any cause of spinal cord illness which is not the result of trauma, such as autoimmunity and infectious agents like meningitis. 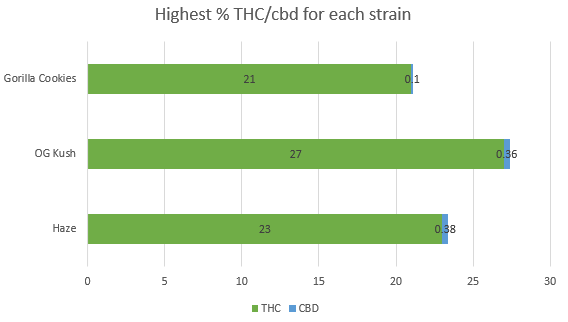 A study in The Journal of Pain in 2016 used a nasal spray which contained up to about 7% THC and found significant reductions in pain caused by Spinal Cord Disease (Wilsey, Marcotte and Deutsch). It is already been shown that medical marijuana can provide benefits to those with illness caused by spinal cord injury, which is damage caused by physical trauma like car accidents. It is used with similar efficacy in spinal cord disease caused by autoimmunity and infection. It can reduce pain and symptoms like spasticity. Medical Marijuana has been used for centuries for appetite, nausea, and sleep. Each of these can become dysregulated by the dysautonomia which is the hallmark of spinal cord injury. Treatment with medical marijuana can greatly improve quality of life in these sufferers by reducing nausea, encouraging proper nutrition, and allowing them to fall asleep and stay asleep. This is a good weed for your thinker. 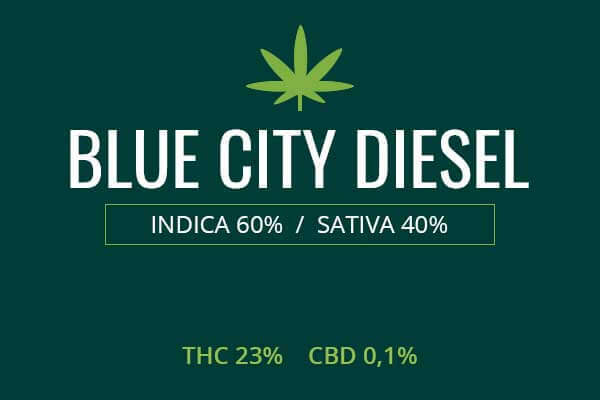 It has about 21 % THC, so it is a heavy hitter. 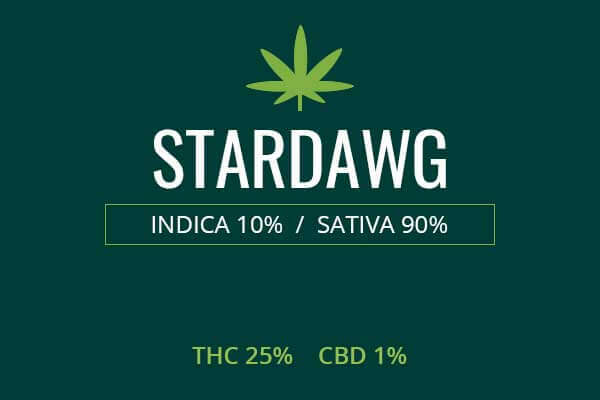 The Sativa effects will take you into a creative stimulation very quickly. This weed will not make you feel too heavy or couchlocked, but using too much can cause panic, so moderate yourself. The stimulation will soon give way to a relaxation and desire to eat or sleep. Enjoy your flavorful and powerful Gorilla Cookies weed strain. Wilsey, Barth L., и др. «An Exploratory Human Laboratory Experiment Evaluating Vaporized Cannabis in the Treatment of Neuropathic Pain From Spinal Cord Injury and Disease.» The Journal of Pain 17.9 (2016): 982-1000. 18 3 2019 г. https://sciencedirect.com/science/article/pii/s1526590016300724.